Heat oil in a kadai in low flame. Add mustard seeds. When it starts spluttering mix it with broken whole red chilly. Add chopped onions, green chillies and ginger. Stir well for at least 2-4 mins. Add chopped mustard leaves. Mix it well. Sprinkle salt and add water. Keep it closed with a lid for around 4-5 mins. Transfer this into your serving plate. 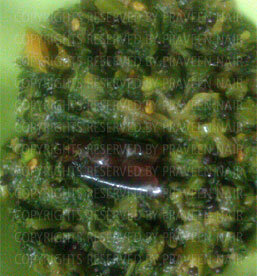 Serve hot with roti or use it as a side dish with rice.